A water storage facility the size of three Olympic swimming pools under the Bendigo Creek and recommendations to stop Geelong’s roads from sinking…. These are just two ideas civil engineering students presented to industry professions last Thursday. The research was part of the students’ honours-year studies. 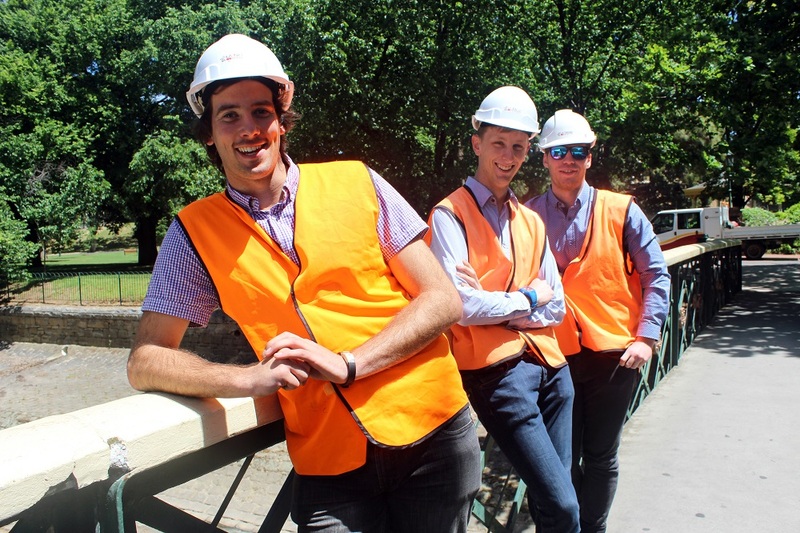 Civil engineering students Dechlan Birt, John Cowell and Lachlan Pittaway looked into whether a water storage facility could be constructed directly beneath the Bendigo Creek. They were looking for new ways the Bendigo Creek could withstand the kinds of floods that take place once every five-to-50 years. “With urban sprawl increasing and more erratic weather patterns due to climate change, we need new ways to convey water downstream in a safe and sustainable manner,” said Dechlan. John said the storage facility would need to be roughly 100-meters long, 15-metres wide and five-metres deep. “It would be placed directly beneath the creek’s bluestones, from View St to Park St in the CBD. When the creek isn’t flooding you could store storm water for use in parks, gardens and recreational reserves. “The worst outcome would be for the creek to burst its banks and that is what we would try to avoid from occurring,” Dechlan said. Engineering lecturer Dr Bandita Mainali said students had criss-crossed the state. “One team is finalising a series of recommendations for the City of Greater Geelong, which struggles with structures like footpaths and roads shifting in the soil.